This chair for clinical examination and operative procedures was made by Mayer and Meltzer sometime in the 1890s. It was commissioned by Adam Brown Kelly (1866-1941), laryngologist at the Victoria Infirmary, Glasgow and was constructed to a design of the leading London laryngologist, Sir Morell Mackenzie. The high back with its adjustable head rest is at right angles to the seat, forcing the occupant to maintain a very upright posture. There is only one armrest, on the left, and the seat's central portion can rotate. All these features facilitate certain otolaryngological procedures. All examination was done using reflected light, the examiner looking down the centre of the beam created by a circular concave mirror via a central hole in the mirror. A lamp was placed slightly behind and to the left of the chair back, with the surgeon, seated, facing the patient. 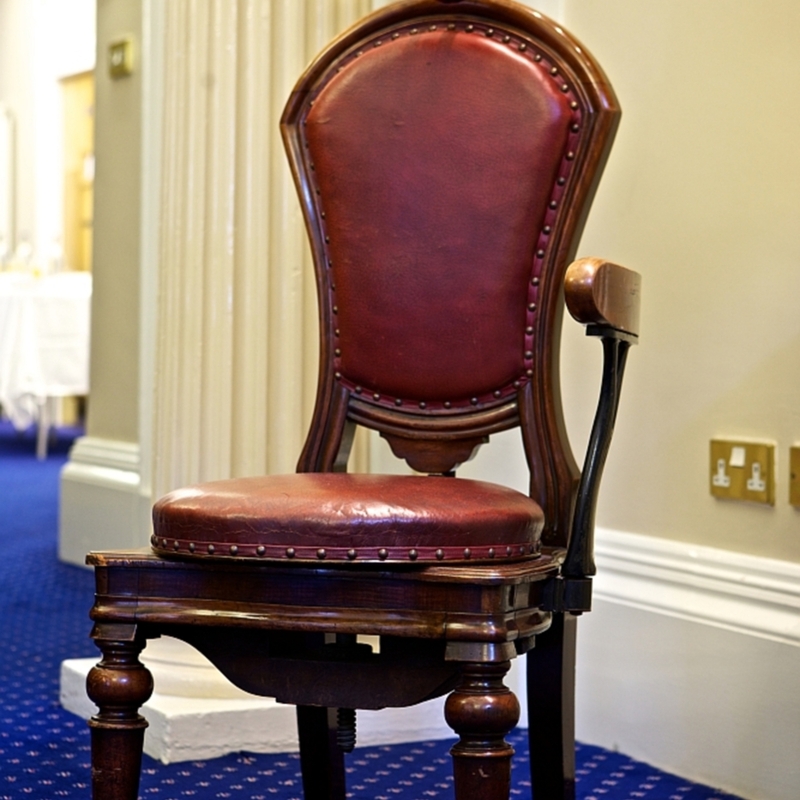 The chair was later used by Adam Brown Kelly's son, Derek, (d.2002) who was also an E.N.T. surgeon at the Victoria Infirmary. Wood, leather, velvet, and metal. Mayer & Meltzer; 1869-early 20th century; Surgical instrument maker, “ENT Examination Chair,” Heritage, accessed April 20, 2019, https://heritage.rcpsg.ac.uk/items/show/107. Description: This chair for clinical examination and operative procedures was made by Mayer and Meltzer sometime in the 1890s. It was commissioned by Adam Brown Kelly (1866-1941), laryngologist at the Victoria Infirmary, Glasgow and was constructed to a design of the leading London laryngologist, Sir Morell Mackenzie. The high back with its adjustable head rest is at right angles to the seat, forcing the occupant to maintain a very upright posture. There is only one armrest, on the left, and the seat's central portion can rotate. All these features facilitate certain otolaryngological procedures. All examination was done using reflected light, the examiner looking down the centre of the beam created by a circular concave mirror via a central hole in the mirror. A lamp was placed slightly behind and to the left of the chair back, with the surgeon, seated, facing the patient. 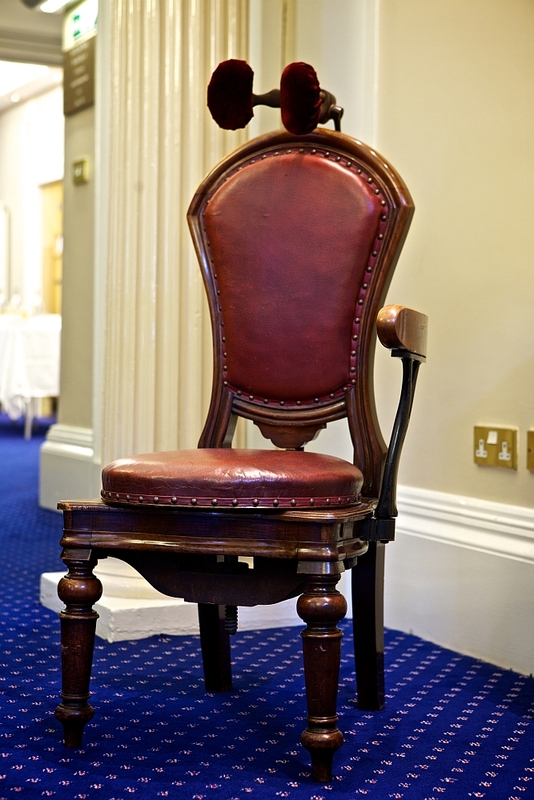 The chair was later used by Adam Brown Kelly's son, Derek, (d.2002) who was also an E.N.T. surgeon at the Victoria Infirmary.